in a previous post on modelling writing. I presented a rationale for creating a modelling frame prior to writing which establishes both the purpose and structure of the modelled writing, which I’d recommend you check out. In this post I’ll discuss what I consider to be the beating heart of my modelled writing sessions: collect, reject, select. It’s a process that puts vocabulary at the centre of the modelled writing process. And it’s simple technique. Collect words to be used in a writing session, reject those that don’t make the cut and select those that do. But like anything the success (or otherwise) is in the detail. This post is about that detail. You’re in the middle of a modelled writing session with your Year Four class. Your character is traversing a windy mountain range on a bright winter morning. You are describing the surroundings. You’ve just written: The wind blew around the mountain . And you ask: How could we describe the snow? You have high hopes. And then the responses trickle in. Cold. White. Fluffy. White. Icy. Snowy. You inwardly groan. It’s going to be a long writing session. The problem is they don’t know the vocabulary of fresh snow: crisp, powdery, thick, feathery, pure, pristine, crystalline, unbroken, undisturbed, trackless, blinding, dazzling. Or they know some of these words but they have never before associated them with snow. The problem here is one of preparation – or lack of it. Each Who knows a word…? (or a variant of it) question is an ambush. Children quickly scramble through long-term memories for words that connect with snow and what’s lurking immediately beneath the surface? Cold, white, fluffy… And out they come. So before any modelled writing session (or indeed any writing session) teach new vocabulary appropriate to the task at hand. By all means have them generate vocabulary too, but teach them some new words, their meanings and how they are used. Try them out orally and in briefly in writing too. This post isn’t about teaching new vocabulary (Bringing Words to Life by Isobel Beck, Margaret McKeown and Linda Kucan is my go-to book for this), but do ensure they are sitting in that modelled writing session with bank of appropriate words ready to trip off their tongues. 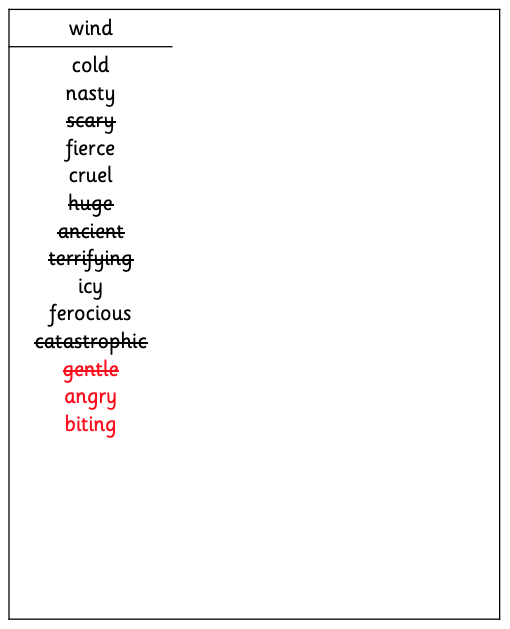 I like to categorise my words into content themes (here words for mountains, weather, and our main character Jub) and also by word class: nouns, verbs and adjectives; it’s helpful that children know that many of the verbs can be used as adjectives too by changing the suffix to -ing (howled to howling, towered to towering) and we can create adverbs from many adjectives by adding -ly (thick to thickly, weary to wearily). I also start with fewer words and add more as we become confident with those currently in the bank hence the gaps. By doing this preparatory work, I can be more confident that when asking How could we describe the snow? higher quality suggestions will be offered. 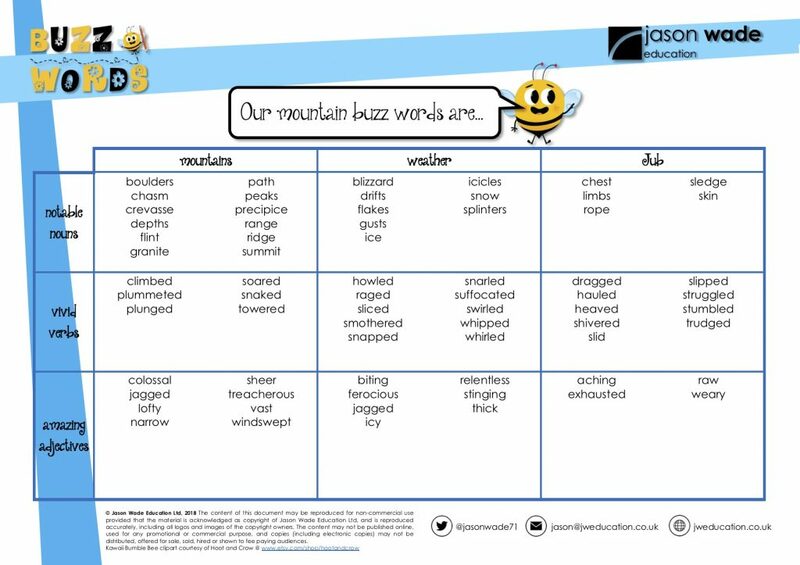 So, we’ve taught some new vocabulary and they have a fabulous word bank sitting on their desk in front of them, now let’s delve into the Collect, Reject, Select process, starting with the first – collecting words to use in the modelled writing. Perhaps we are writing our Macbeth openings. the witches will make an appearance and we want to set the scene, perhaps by describing the bleak location and the onset of a storm. As a starting point for improvement you write down The wind blew across the heath. And you say Hmmm, I think we could describe the wind to make the wind sound strong like in a storm. Let’s hear some great suggestions from you. Make it clear that children should use the word bank (so give them time to peruse it). Guide them to the appropriate section – Let’s all look at our weather words. But be equally clear that you are happy to take suggestions that are not on the word bank. After all, it cannot capture every possible word. I often write a list of the words that are suggested; If you’ve done your preparatory work well, you’ll likely receive more suggestions, and the list ensures that all are considered, one are forgotten. A sheet of flipchart paper stuck to the wall next to where you are modelling does the trick well enough. At this point take all suggestions – no filtering out weaker suggestions. And value them all: I find a simple Thank you everyone for your suggestions does the trick. I might pepper in some personal thank you’s along the way to those children who don’t often offer suggestions in class – Thank you, James. And keep an affable air of positivity as you do it; we want to signal that all contributions are welcome. After gathering ideas and jotting them down in a list, we might end up with a list like [fig.2], containing the good, the bad and the ugly, but at this point with no hint or suggestion as to which words fall into which camp. At this point consider adding your own word choices to the list. Perhaps the list doesn’t contain the quality you’d hoped for (in which case, your preparatory work perhaps didn’t hit the spot). Perhaps, on the spur of the moment a few new words occurred to you that you were a fool for not putting on the word bank. Perhaps a child’s suggestion has sparked an idea or two in your mind. When adding words to the list add both appropriate an inappropriate choices (we’ll reject the latter soon enough). Adding weaker teacher choices normalises making weaker choices. It says Hey even I think of poor words. It says I value every effort and contribution regardless of quality. So we now have our collected bank of words (the teacher additions in red for illustration purposes only) in [fig.3], it’s time to do some pruning. It’s unlikely that as a result of collecting words you will have a list containing only high quality words appropriate to the context, so you are going to have to reject weaker suggestions. There are a variety of reasons you might reject a word. The word might not fit the mood of the writing. We are creating a dark atmosphere so we’d need to reject words that don’t fit that mood. Perhaps a word is too formal or too colloquial for the writing. Perhaps the word doesn’t mean what the child who suggested it thinks it means. Perhaps it’s word that is typically associated with one context but is being incorrectly applied to another. Perhaps it’s a question of degree: perhaps a word isn’t scary enough or perhaps it’s too scary. Perhaps we’ve already used the word elsewhere in the writing. Perhaps it’s an all-too-obvious cliché. Perhaps it’s a simple word used far too often. Perhaps it’s overly alliterative or creates an accidental rhyme that sounds cheesy when spoken aloud (pet hates of mine). The point is there are myriad reasons you might reject a word. But every word earmarked for rejection has one thing in common. the child who suggested thought it was a good choice. Otherwise, they wouldn’t have suggested it. There’s a misconception at the heart of the suggestion that needs addressing. The most important part of the reject process is to explain why we are rejecting a word. 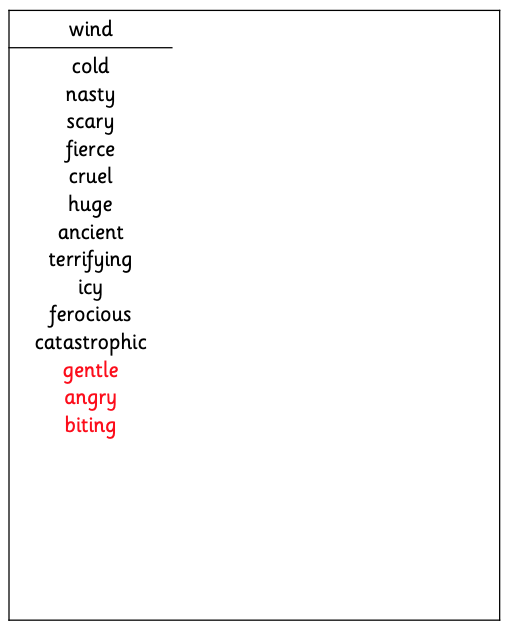 With our list of words we might reject gentle because it makes the wind sound nice and we want something scarier. We might reject terrifying because it suggests there is somewhere there to be terrified when there isn’t. We might reject scary for the same reason. We might reject ancient and huge because winds are not typically described as being old and big. We might reject catastrophic because it suggests the kind of large scale damage that only a tornado might cause. We might reject cold, not because it’s a poor choice, but because we also have icy which performs the same function as cold and then some. After rejecting a word place a line through it. These words will be left up for children to refer to when they write following the modelled session. And you just know that if you don’t cross out gentle, twenty minutes later a child will look up at the list for a word to describe the wind, see gentle on the list, forgetting we had rejected it, and will add it to their writing. Similarly, if writing word lists on a dry-wipe board, don’t erase rejected words. Again, a child will think Would gentle be a good word to describe the wind?, will not recall it being rejected and use it. So we might end up with [fig.4]. Notice, I haven’t crossed out cold despite rejecting it. Crossed out words are those we don’t want children using at all. If a word is rejected in this instance but could be put to good use in a child’s writing (perhaps they’ve used icy elsewhere), leave it as it is. Rejecting is the part of the sequence that some teachers find more difficult. In my experience teachers are a positive bunch who would much rather celebrate children’s successes than point out their failures, especially if a child has made the effort to contribute. But to not reject words to save children’s feelings only dooms them to thinking that poor choices are good choices and to use poorer vocabulary in their writing. I find an affable, friendly tone, showing appreciation (I like that you suggested…), pointing out the positives (That would be a great word if we were describing a sunny day but…) works in most cases. But you know your children and what will work in particular circumstances. We are now left with a smaller list of words from which to select the one we will add to our modelled writing. There are a range of reasons you might select one word over others. It could be to evoke a particular tone or capture a precise idea. We might group words. I can see some words that tells us the wind is cold like icy and cold – and some that are violent like biting and ferocious. I think I will select a violent word, perhaps cruel because it makes it sound like the wind is evil and wants to hurt everything. It might be that one word captures multiple ideas. 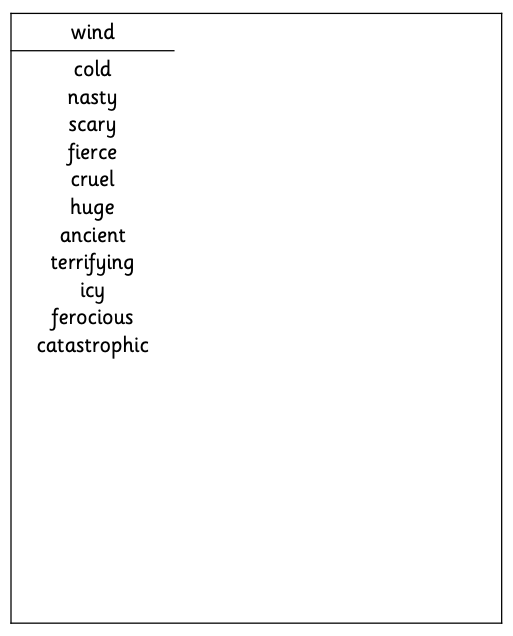 In a recent modelled writing session we had listed words to describe a dark, miserable sky. Among our words were grey, heavy and leaden – all good choices. I selected leaden, explaining that it means heavy but also that lead is grey, so we can capture the ideas of both heavy and grey in a single word. It may be that a word fits more neatly with those words surrounding it. Perhaps we’ve written the sentence A sickly sun drifted across the sky with a view to improving drifted. perhaps we might select a word such as limped or a phrase such as dragged itself to continue the idea of a sickly sun. 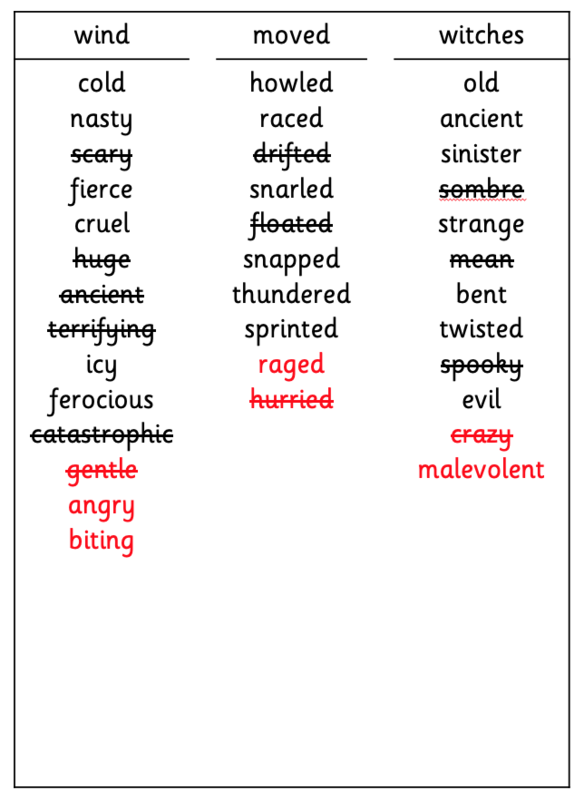 A good reason to choose a particular word is that whichever word you select is the one that most children will use in their writing, particularly the less confident writers. So select those words that you keenest to add to their vocabularies, those that have the most utility in a wider variety of writing. And of course you might want to hand over the selection process to the children. Which word would you like to select from those we have remaining… Chloe? secure in the knowledge that whichever word Chloe now selects is going to be a good choice. Over the course of a modelled writing session we might use the Select, Reject, Collect sequence several times [fig. 5], ending up with lists of great words for children to use in their writing following the modelled session. There are, of course, downsides to the Collect, Reject, Select sequence. The most notable is that it takes time and slows the writing process down. On balance, it’s time worth investing in most cases. But there are times you might not want to slow the writing process down for one reason or another. So you might use the Collect, Reject, Select technique orally with nothing written down. It speeds up the process considerably, but with nothing written down is less useful a tool for when children come to write. It’s a trade off worth making at times, particularly if there are only a few word choices in the running – The wind howled over/across/above the heath – or if the choices are between words we all know well. And there are certainly times I know exactly which word I want to use it the writing. I want to teach them how to use a particular word so taking the collegiate approach isn’t desirable. So, there you have it – Collect, Reject, Select. A simple but powerful tool that develops vocabulary in context, unpicks writerly word choices and weeds out misconceptions about meanings and usage. For me, it’s the most powerful weapon in modelling writing arsenal. If you find this blog useful, I’d love to come to your school and train your staff on how to teach modelled writing, which includes many more tips on producing high-quality shared writing. Please check out my training page and get in touch.